AAACK, I've definitely fallen and I can't get up. I have NO mojo, no desire to stamp. What is WRONG with me? I used to be able to crank stuff out whether I wanted to stamp or NOT! These days, I run quickly past my stamping desk and try not to feel guilty for all of the mindless purchases I've made, and not focus on the piles of paper and stamps that are sitting there untouched! I don't want to stamp! My life has gotten crazy; full of summer projects and friend get-togethers, and *GASP* dates! Confession time. I've entered the dating world again. I can't believe I said that out loud. Anyway, here's my pitiful attempt at trying to throw some cards together tonite. I need just about every type of card occasion now for my non-existent, dwindling work-stash, so birthday will have to do for this attempt. 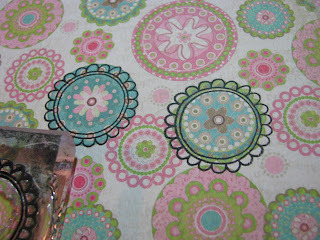 I used scraps of My Mind's eye polka dot papers, and some Bo-Bunny flowery Allissa-Twirls pattern. 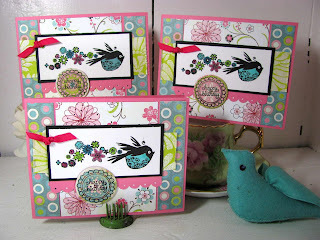 Bird stamp is Inkadinkadoo from Michaels. 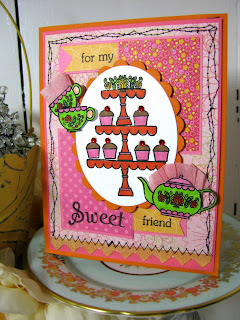 I discovered that the fun Pink Persimmon flower greetings stamps are great to use as sentiments! So I stamped, at least! PROGRESS! May your mojo be plentiful today, everyone! 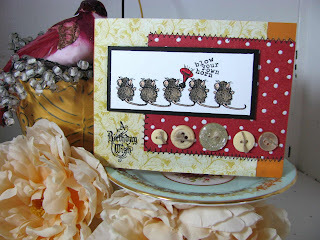 Tonite I have another little party mouse sample, done with a new Crafty Secrets medium stamp set called "Mouse Party". This set has not been released yet, but it is one of the new releases that will be offered at the CHA July show in Orlando. Here I used some crackly wood paper along with a blue harlequin pattern from Crafty's "Pastel" paper pad, and stamped a mouse in the corner, as if he's coming out of the woodwork. 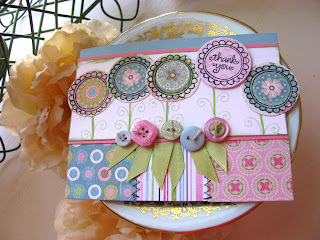 I used a Spellbinders Nestabilities "Pinking' circles die to create a fun little spiky mat for my main image. 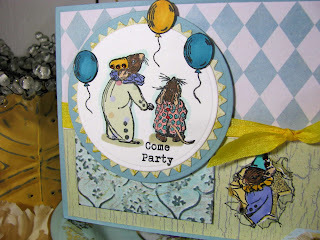 I also glued balloons to the edges of the image so that it seems like the MEECE are watching them float off! Hope you have a wonderful Father's day this weekend...it's time to appreciate those hard-working Dads! YIPPIE! 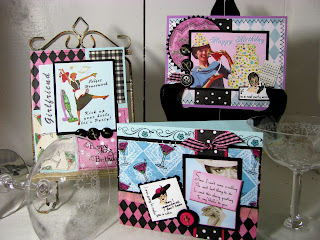 The Crafty Secrets new release CHA stamp sets are getting sent to the design team! I got my first set in the mail today, and it's a CUTE one! This set is called "Mouse Party" and is a medium set that will retail for $14.99! 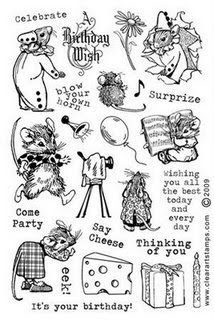 I sat down tonite and started playing with all the cute little MEECE (that's mice, plural) and was dying from the cuteness! The cool thing about this set is that you can create fun little detailed scenes, or keep it simple and stamp a row of MEECE and color them in! Here I went simple and just stamped 5 mice in a row, stamped a horn in one of their hands, and then just colored them in easily with a "Sand" colored Copic marker. Their ears and tails are Copic "Baby Skin Pink", and the horn is Cadmium Red. SO QUICK to make, in fact I'm going to get back in there tonite and start cranking out more of these little guys. The cards are gonna multiply like, errr...MICE. Here I went more detailed and created a little scene with the photographer mouse taking a birthday photo of the birthday rodent! I had to use some vintage sheet music with this because it ties in with the mousie's little song book! I LOVE THESE MEECES TO PIECES! Good morning! I'm home today, getting ready to head outside and enjoy some rare Minnesota sunshine in my back yard! This morning I got up and started digging into my to-do list. 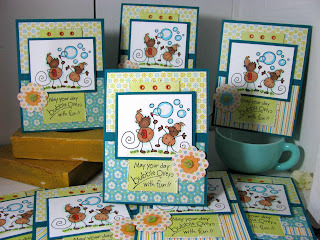 I'm REALLY low on birthday cards so it's time to build my stash back up again by doing multiples of cards! I scored this cute Stampendous Changito Bubble birthday stamp at Archivers a month or so ago, and am just getting around to inking it up. I'm getting back into use-it-up mode because I have SO much patterned paper, I'm feeling the need to PURGE and get rid of it. 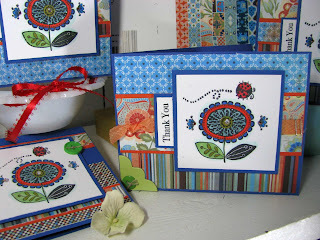 I had bought a set of cuttlebug flower dies at Michaels a while back, and thought it would be fun to use up paper by cutting out coordinating patterned paper flowers to match my Die Cuts with a View Citrus stack paper. I LOVE the changitos! 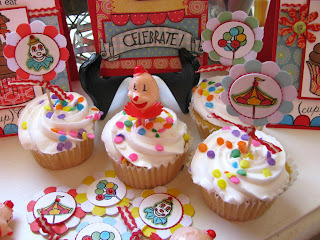 Don't they look like they're having so much FUN at their bubbly little monkey party?! I wanted to wish sweet Taylor VanBruggen a HAPPY HAPPY birthday today, on cupcake Friday! 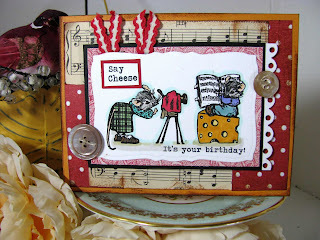 A bunch of talented bloggers came together today to celebrate her birthday in grand BLOGGER style, by playing in Taylor's sketch challenge and linking our blogs to Taylor's HERE! If you feel like playing along and want to wish Taylor a happy birthday, check out her blog for the challenge and then link your card up through Mister Linky! There should be some AWESOME eye candy to check out! 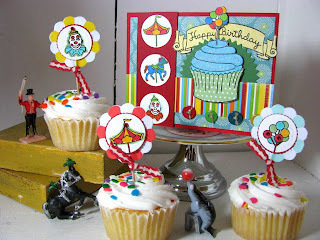 I don't have a TON of cupcake stamps, but since I was already playing with Pink Persimmon's new release "Vintage Cupcake" stamps, I thought I'd do another card with the circus stamps! I used baby boy blue sparkly fluff for the cupcake topping...ooh, wouldn't it be cool if you had a cotton candy stamp and could use blue fluff for the cotton candy? 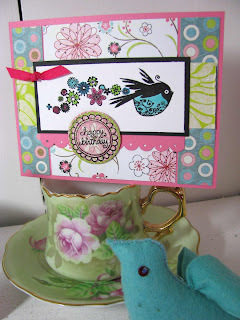 The blue patterned paper is My Mind's Eye Chloe Lynn/Penny Lane paper , and the striped patterned paper is Bo Bunny. 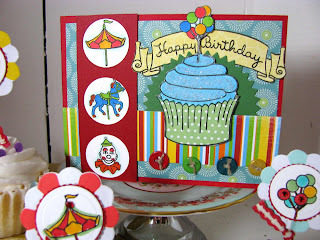 I cut circles out of the red paper strip and then stamped my circus characters inside the circles and colored them in. Happy Birthday, sweet Taylor, I hope you have a cupcake-filled day! 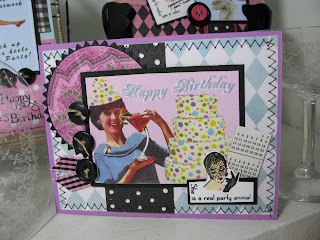 Tonite I thought I'd post a birthday party ensemble I created for Pink Persimmon's new release "Vintage Cupcake" stamp set. 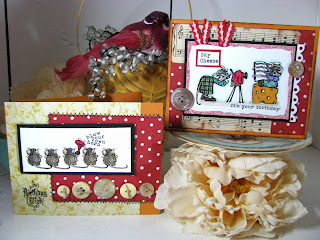 I thought I was going to have a coronary when I first laid eyes on this set! 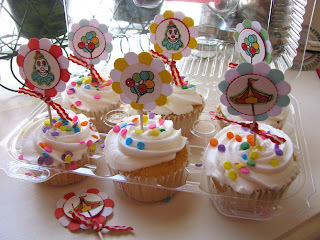 I had to pop an email off to Darcy and tell her about the cool vintage clown cupcake picks that I had PASSED up at a junk sale up by my cabin! I was so sad that I didn't buy the jar of cupcake picks, because at the time, I thought, WHAT am I ever going to do with these and why would I buy them? So I put a call in to my Aunt Jackie up in Cumberland, WI and asked her if she could track down those picks from their friends, who are local antiques dealers. SHE SAVED THE DAY! I GOT MY CLOWN PICKS! They even came with little circus figures! 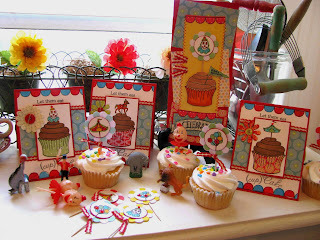 So I modeled the invitations after the cupcake picks, and created these simple invites by paper piecing with various scraps of fun paper. I used light walnut copic to color in the chocolate frosting on the cupcakes. 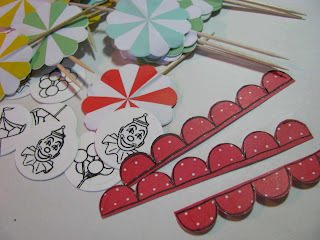 I thought it would be fun to create these little paper throw-away cupcake toppers; I found the little toothpick pinwheels at Macy's; they are by Martha Stewart and come in an assorted color pack. 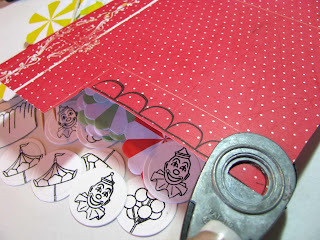 I simply punched out circles with my nestabilities dies, and then stamped Pink Persimmon clowns, balloons & tents on them. 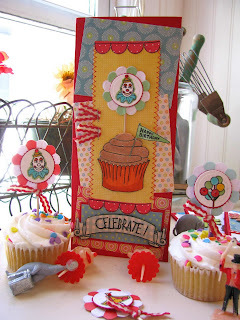 I created a birthday card for the lucky birthday kiddo, and made it extra tall and large, so I could add a cupcake with a pick on top to match the cupcakes. 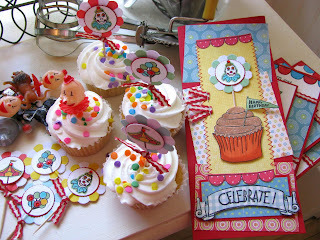 I used Our Craft Lounge Sparkly fluff for the cupcakes, to create soft, 3-d frosting with sprinkles in it! 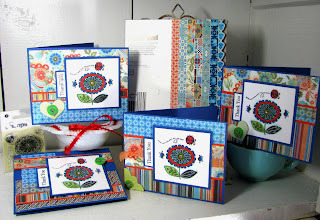 I also discovered a cool thing; if you use the banner/awning stamp from this set, you can punch out the scallops with your Stampin Up 1/2 circle slit punch. It works PERFECTLY! 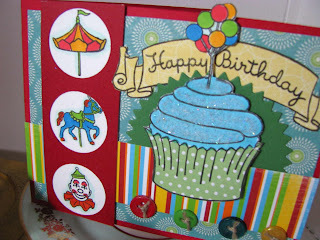 I used the patterned paper scallops to decorate my clown card. My desk pretty much looked like the circus had hit town by the time I was done with my ensemble! I BAKED these beautiful sprinkly cupcakes and then just PUT them in the Target plastic container to make sure they didn't get ruined. Okay I lied. Target made the cupcakes. 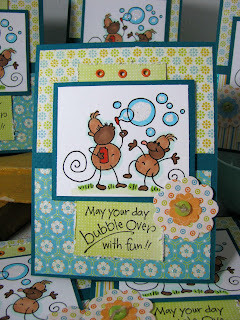 I'll have a another fun card for you on Friday that I did with this set! OOOH I'm SO late to the party, Crafty Secrets should be giving me demerit points! AAAACK! I'm blaming this one on the bad party girls that camped out at my house this weekend and dragged me kicking and screaming (NOT) to Grand Old Day in St Paul for live music and AHEM, merriment. It's certainly what inspired these three cards tonite. 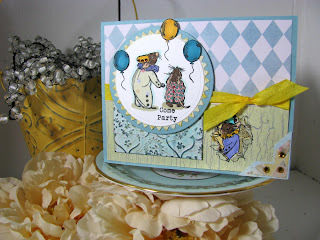 The Crafty Secrets design team challenge this week was to create BIRTHDAY cards. 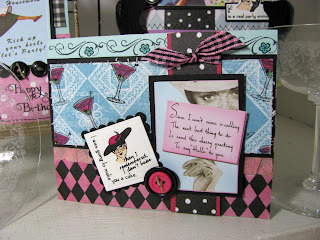 I pulled my Crafty Secrets "Glamour Girls" stamp set, specifically for the cool martini glass in it! 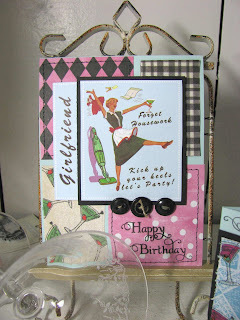 I paired the martini stamp up with some fun vintage images from Crafty's "Girlfriends" creative scraps. 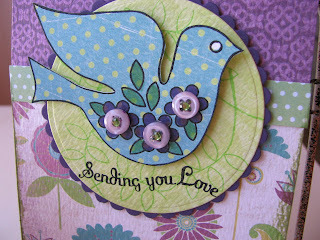 For this card I HAD to use this funky purple paisley paper, and cut out a circle with my Nestabilities dies. 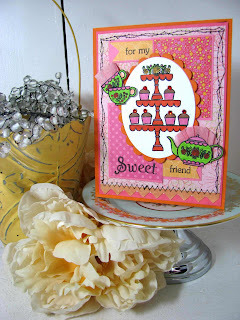 I just got my large round pinking nestability dies in the mail from Spellbinders, and HAD to use it to mat my paisley paper! The talented design team chickies have outdone themselves on this challenge, so be sure to check out all their EYE candy on the links below! Anna is having a gift certificate drawing too, so you're gonna want to ENTER! It's a rainy Saturday here in St Paul, and while I'm sitting here waiting for my girlfriends to get here, I thought I'd post another sneak peek of a new Pink Persimmon stamp set, that will be released June 8th! This set is called "Flower Greetings". The set comes with 4 cute little flowers that say 'thank you', happy birthday,"for you" and "a little note"~! Because I'm a notorious stamp killer, I took one of the flowers and cut the sentiment out of the middle so that I could use the outside of the flower for paper piecing. 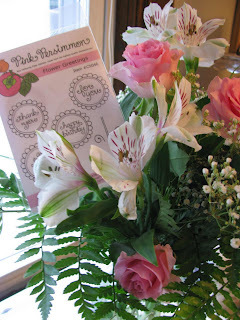 Using my Stampin Up rubber scissors, I carefully cut "for you" out of the middle of one of the flowers. 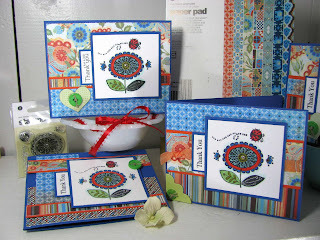 I stamped the flower around the centers of some My Mind's Eye Penny Lane "Graceful circles" paper, and then cut the flowers out with my Nestabilities circle dies. 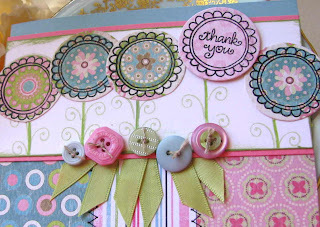 After I cut them out, I stamped stems and then added buttons and ribbons below the flowers to add some whimsy! 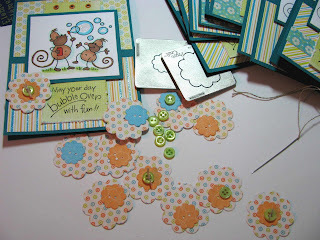 Here's a blurred out photo of the stamp set, just to give you an idea of the sheer cuteness! Don't forget to make your orange and pink challenge card this week and enter the contest for a Pink Persimmon gift certificate, HERE! Good Morning, everyone! 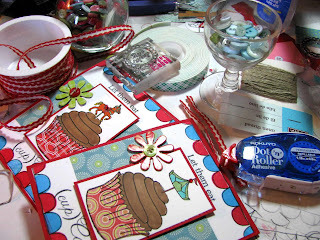 I'm popping on to sneak in an early morning post! I got the go-ahead to show you some brand new release Pink Persimmon stamps that you'll be seeing go up for sale on June 8th! 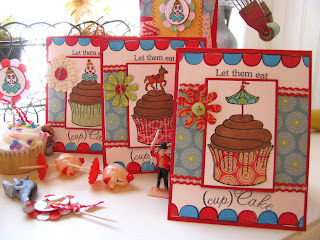 OOOH you are going to DIE when you see all the yummy stamp sets they are coming out with for this release! 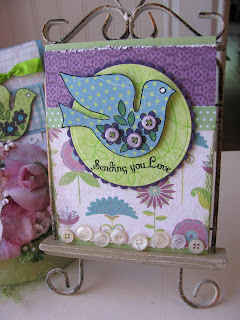 These are some of the cards I worked on this weekend with their new stamp called "Love Dove". 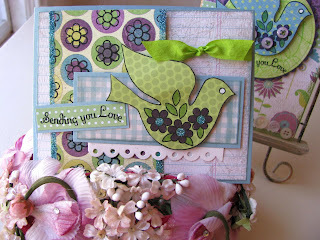 The sweet little whimsical dove has FLOWERS on it, that can be colored in and glittered or prima'd! 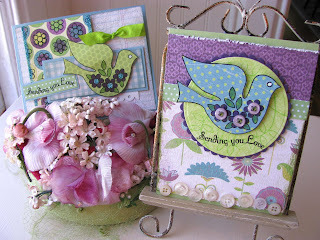 For these cards, I paper pieced the dove by stamping it on fun polka dot paper, and then used a purple copic marker to color in the flowers. Think of the possibilities for flower centers on these doves! 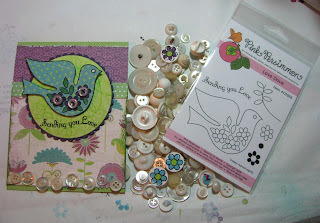 Here I used buttons with a single olive colored rhinestone in the center of the flowers. 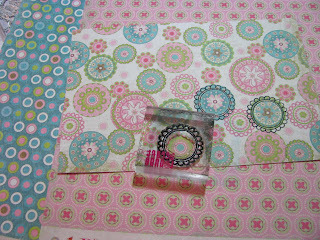 The set also comes with a separate little flower stamp, so here I took some My Mind's Eye Penny lane Maggie May circles patterned paper and stamped the flower inside the fun purple circles for my background paper. I dumped out a bunch of my vintage white buttons (to pick out little ones) that I bought on my last trip to Haupt Antiek market, and then glued a little row of buttons at the bottom of the card. Sending you love today; have a sunny Wednesday!